With the Hobey Baker now on his mantlepiece, Cale Makar has his sights set on winning a national championship with UMass. After that? 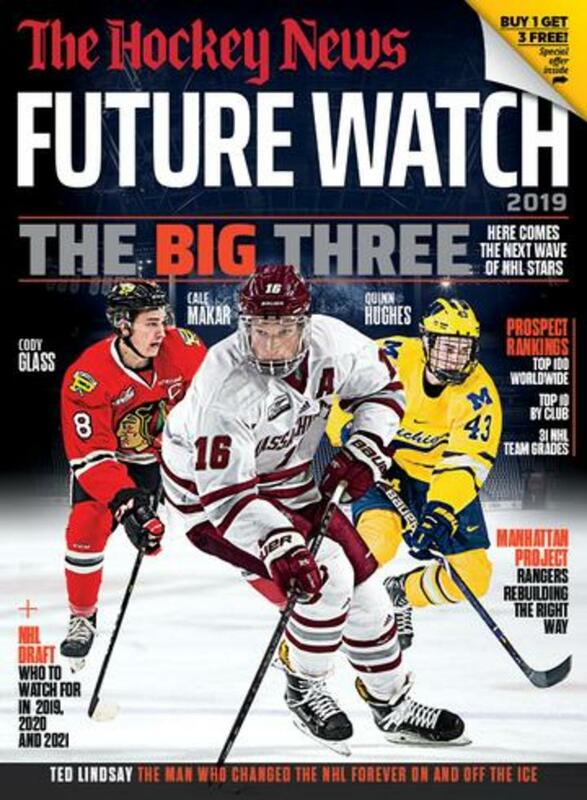 It's off to the Avalanche for the top-ranked prospect in The Hockey News' Future Watch edition. BUFFALO – Fresh off being named winner of the Hobey Baker Award as the most outstanding player in U.S. college hockey, Cale Makar is ready to go out and win a national championship, then sign and play in the playoffs with the Colorado Avalanche, in that order. He’ll have the opportunity to accomplish the first one Saturday night when his UMass Minutemen face the Minnesota-Duluth Bulldogs in the Frozen Four championship game. And there’s a very good chance – pretty much a slam-dunk, actually – that shortly after that game, Makar will be on his way to join the Avalanche for Game 3 of their first-round playoff series against the Calgary Flames. If and when Makar signs, he’ll be eligible to play for the Avalanche immediately. And while signing this year will burn a year of his entry-level deal, it will not count as an accrued season as far as free agency is concerned. It’s a very real risk for the Avalanche, who will lose a year on Makar’s entry-level deal and may have him in their lineup for only a handful of games. And more importantly, because he’ll have completed his third year in the league once the Seattle expansion franchise begins playing in 2021, the Avalanche will have to protect him in the expansion draft. And once the Avalanche are eliminated, Makar cannot be sent down to the Avalanche’s AHL team for its playoff run. Ideally, the Avs probably would prefer to sign Makar to a professional tryout contract and put him with the Colorado Eagles for the rest of this season, but Makar has no interest in doing that and would instead stay in school and finish the academic year if the NHL were not an option. As far as the championship game is concerned, Makar will be looking to have a big impact on the proceedings. Even though he had an assist in the Minutemen’s 4-3 overtime win over Denver Thursday night, UMass coach Greg Carvel is expecting more from him in the championship game. For his part, Makar is looking to replicate the success he had in Buffalo a little more than 15 months ago. The KeyBank Center has been very good to him, considering that’s where he helped lead Canada to the World Junior Championship in 2018. Makar led all defensemen in scoring in the tournament with three goals and eight points in seven games and earned a berth on the all-tournament team.